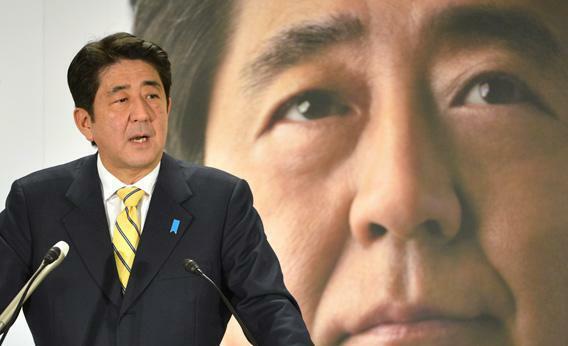 Japan election: Shinzo Abe’s plan to save the Japanese economy. Can Shinzo Abe Save Japan? The candidate with a plan to cure what ails rich economies. Shinzo Abe, president of Japan’s Liberal Democratic Party (LDP). Photo by Kazuhiro Nogi/AFP/Getty Images. Japan has been in the economic doldrums since before it was cool. While the United States and Europe waited until 2007 or so to have a real estate crash followed by a prolonged period of slow growth and high unemployment, Japan got in on the act in the 1990s. The country got a brief respite of export-led growth for a couple of years in the aughts under former Prime Minister Junichiro Koizumi, but then was rapidly dragged back down into the muck by the worldwide economic collapse. At this point things have been so bad in Japan for so long that foreign commentators have largely stopped even hoping for a turnaround, just vaguely gesturing at the idea that perhaps a recovery in Europe and America could help Japan out. But at a time when most eyes are on the U.S. fiscal cliff and E.U. negotiations over Greek debt, the real economic game-changer may be Japan’s Dec. 16 election. That’s because Shinzo Abe, the overwhelming favorite to lead the Liberal Democratic Party to victory, is running on a bold platform of unlimited quantitative easing and more inflation. If this works—and the odds are that it will—Abe will not only cure a great deal of what ails Japan, he’ll light a path forward for the rest of the developed world. It’s odd that Abe’s vision has received so little attention, given that until relatively recently there was overwhelming consensus in the West about what needed to be done: unlimited quantitative easing and more inflation. The reasoning is fairly simple. A country in the wake of a big asset bubble needs very low real interest rates in order to stimulate investment. In Japan’s case the need for very low real interest rates is particularly acute because thanks to a paucity of immigration the country’s population is actually shrinking, which reduces the demand for interest-sensitive goods like houses. So when nominal interest rates are already at the zero bound, the central bank’s best tool for stimulating growth is to raise expectations of inflation. Nominal interest rates can’t go below zero, but inflation-adjusted rates can be as high as you like as long as there’s enough inflation. But rather than target rates of inflation higher than those in other developed countries, the Bank of Japan has spent the past 20 years generally targeting a zero percent inflation rate. Back in 1999, Ben Bernanke condemned the self-induced paralysis of Japanese monetary policy made by flailing officials who claimed it was beyond their power to fix this. He called for “Rooseveltian resolve” on the part of Japan’s leaders to shake the bank out of its torpor. But then a funny thing happened. When Western economies started crashing in 2008, everyone forgot their advice to Japan. As Federal Reserve chairman, Bernanke fell into a self-induced paralysis of his own, engaging in creative credit easing strategies but refusing to budge from strict inflation targeting. Friedman was dead, and American conservatives swiftly became proponents of the theory that Bernanke’s policies were excessively inflation-oriented. Liberals spent the winter of 2009-10 focused on fiscal policy, with Obama and congressional Democrats making essentially no effort to put a more stimulative monetary framework in place. Suddenly, criticizing the Bank of Japan went out of style. America became Japan and simultaneously forgot what America used to think about Japan. But the old monetary theory about what might solve Japanese stagnation has never been put to the test. Now Abe’s finally going to give that old-time advice a try. Japanese politics is murky, and even if he wins the election he may not end up with the political and institutional clout to make it happen. In fact, as Election Day draws nearer, he’s already walking back some of his rhetoric under pressure from the business establishment. But if he does manage to stick to his guns, the odds are good that it will work. Monetary expansion should reduce the price of the yen and goose exports. More importantly, it will push domestic real interest rates down and spur investment. Creating firm expectations that yen-denominated prices will be higher in the future than they are today should encourage firms and households alike to acquire real goods sooner rather than later. And all this ought to encourage everyone to be investing and spending more. Bernanke said Japan’s central bankers needed Rooseveltian resolve, but the moral of the story may be that it takes a politician—a Roosevelt—to have the clout and legitimacy to make central banks act decisively when an economy gets firmly mired at the lower bound. If Abe can be that Roosevelt, he’ll not only be a hero of Japan but possibly of the whole world economy. After all, if America’s old advice to Japan turns out to work in practice as well as in theory, then maybe we’ll finally get around to taking our own advice for ourselves.